The Northern Ireland Assembly held an event in Parliament Buildings on Friday 2 December, with the Cedar Foundation to mark the International Day of Persons with Disability. The Assembly is committed to promoting positive attitudes towards people with disabilities and encouraging participation by people with disabilities in public life. Friday’s event included a presentation on ‘How the Assembly Works’ and marked the beginning of a joint work programme between the Assembly and the Cedar Foundation. The programme will aim to encourage people with learning disabilities to engage more with the Assembly. The programme will be formally launched during Assembly Week, 20 – 24 March 2017. 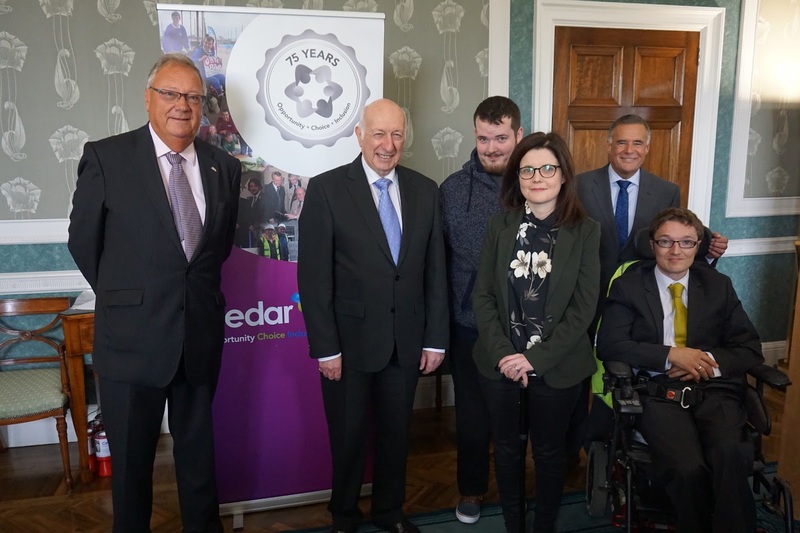 The Cedar Foundation works to provide opportunities, choice and inclusion for those living with disabilities and is the Northern Ireland Assembly’s Charity of the Year 2016. Today’s event is part of the Assembly Commission’s wider work on disability. One of the Commission’s priorities is to ensure that Parliament Buildings is a welcoming space for everyone; visitors, staff and MLAs alike. Parliament Buildings was built in 1932, so, of course, over the years many adjustments have had to be made to make it more accessible. As it is a listed building, staff work closely with the Historic Environment Division of the Department for Communities when making any physical changes. In recent years, to provide wheelchair access at the front of the building, an external ramp was also installed at the entrance, and further work is currently under way to improve accessibility at this entrance, including the provision of ramped internal access. As well as these physical changes, the Commission has also worked with many disability organisations to improve facilities for visitors with disabilities. In 2011, the Northern Ireland Assembly became the first legislature in the UK to be awarded the Action on Hearing Loss ‘Louder than Words’ best practice charter mark. Hearing loops have been installed in locations throughout the Building. We also have a Changing Places toilet facility, and a Quiet Room, which provides an autism-friendly space for visitors. For visitors taking tours, a Braille tour guide is available as well as a signed tour, and visitors can contact staff in advance to request a hearing interpreter for their tour. In addition, eleven members of staff are trained autism champions, so people can contact them ahead of, or during, their visit. Our Education Service has also worked with young people with disabilities through its work with Assembly Committees and the Northern Ireland Youth Congress. You can read their article on the International Day of Persons with Disability here. We have policies and guidance in place to ensure that people with disabilities can participate in the work of the Assembly. At the moment, we’re currently working on sign language guidance, and we’ve also recently signed up to the Equality Commission’s ‘Every Customer Counts’ initiative and its Mental Health Charter. Our Disability Action Plan 2016-21 sets out what the Assembly Commission plans to do over the next five years to meet its duties under disability legislation. You might also be interested in the Research Matters blog from the Assembly Research and Information Service (RaISe) which discusses some of the resources produced by RaISe in this mandate and the previous one in support of the Assembly's scrutiny of disability policy and legislation. We are aware that more can always be done, so we will continue to work with individuals and disability organisations to identify opportunities for the future.